HL7 syncs clinical data, retail data, and electronic health records between your current software system and TIMS Practice Management System. 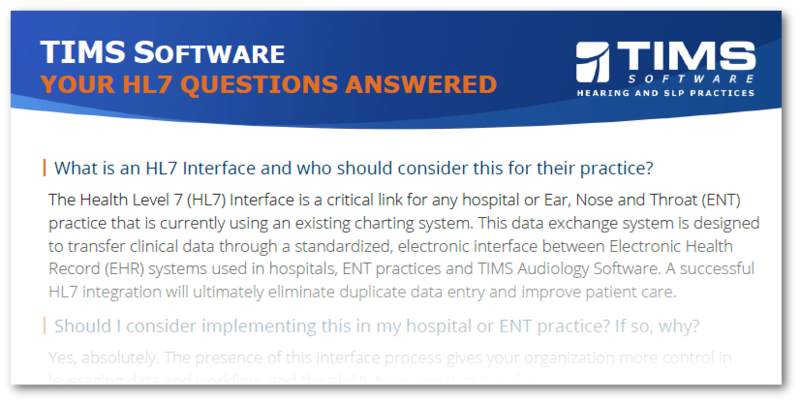 With HL7, TIMS Audiology becomes an extension of any hospital system that follows the HL7 messaging standard. As new patient records are added, changed, or modified, HL7 messaging keeps this information current, eliminating the need to manually re-key data. The end result is up to date and accurate patient records and information across multiple software systems. No more duplicate patient records. The Health Level 7 (HL7) Interface brings together your clinical data, your retail data and your electronic health records to work as one. And, it is a critical link for any Hospital or Ear, Nose and Throat (ENT) practice that is using an existing charting system. Within this download, you will get the common questions answered about how TIMS is able bring all your data on one system.